After a less-than-impressive performance from Olathe North in week seven, the Eagles came out and dominated Blue Valley West from the opening whistle. Olathe North's defense held Blue Valley West to two first half first downs, and the score at the half favored the Eagles 35-0. Olathe North's James Franklin only carried the ball once in the second half, but still closed out the game with 16 carries for 159 yards and two touchdowns. For the second week in a row Blue Valley came out with an offensive attack the had been hiding all season, and this time around it got an Olathe school. The Falcons from Olathe South failed to eliminate many of the mistakes that have been haunting them the entire season, most notably defensive liabilities. Tanner Dutton completed 21 of 29 passes for 267 yards and a touchdown for Olathe South, but once again the offensive fireworks weren't enough to collect the victory. Blue Valley North literally used every page of the playbook to get a victory, but in the end Olathe East came out on top. A fake punt touchdown pass bumped Blue Valley North to a quick 7-0 lead, before Olathe East separated themselves and had gained a 28-7 lead by the start of the fourth quarter. From there, Blue Valley North ripped off four touchdowns (three on Danny Dolen touchdown passes). However, Olathe East scored three touchdowns of their own to grab a 14 point victory. In a sad reminder of the times for Lawrence alumni, LHS remained winless, this time in the form of a 28 point drubbing from their cross town rival. Free State's Camren Torneden (below) opened play with a 71 yard scamper to put Free State up seven--ultimately the touchdown was an omen of things to come. 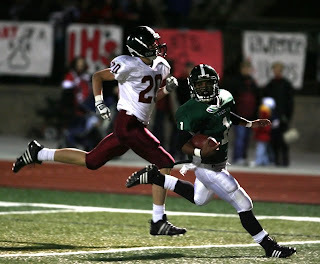 Lawrence lost fumbles on their next two possessions which led to easy Free State scores. The Chesty Lions have their last chance of victory against Leavenworth this Friday in a clash of winless teams. Olathe Northwest broke the school record for points in a game for the second week in a row with their 63 point shutout of Leavenworth on Friday. The Ravens, who sealed a playoff berth with the win, were led by were led by their usual skill position players Josh Lemke, Brandon Bouvilom, and Cullen Phillips, who combined to score seven touchdowns. It appears as though Blue Valley Northwest is peaking at the right time of the season--an unfortunate draw for the Raiders from SM South. Blue Valley Northwest scored all of their 34 points in the first half of the game, feeding off of two Koby Chadick touchdown passes of 25 and 34 yards. In perhaps the biggest stunner of the 2009 season thus far, SM East was able to pull out a one point victory in their second district game and ultimately secure a playoff berth. An early defensive touchdown for SM Northwest put the Cougars up 6-0, but a botched extra point ended up costing them in the end. SM East was able to produce its 13 points off two touchdown passes to Kevin Hertel, while SM Northwest was only able to add two more field goals in the game. Statistically SM West played one of their more sound games of the season in handing SM North it's sixth straight loss. SM West scored two defensive touchdowns, four rushing touchdowns, and one passing touchdowns in jumping to a 49-0 advantage at the beginning of the fourth quarter. The Vikings will square off against their rival SM East--who is also 2-0 in district play--for the district championship on Friday.